If you’re in the market for the best small elevators for homes, you’ve come to the right place! Shaft-Less Duo: The Duo is an economical way to add an elevator to any two-story home. The small footprint and shaft-less design allows it to easily fit into most typical floor plans. The site preparation work is very minimal, keeping the costs low. The Vista option adds a clear polycarbonate panel to the back of the cab. There is also an option for a folding seat in the cab. Shaft-Less Trio: The Trio is just like the Duo, only slightly larger. The Trio also has an option to add a clear polycarbonate panel to the back of the cab. The Trio is large enough to accommodate a wheelchair. 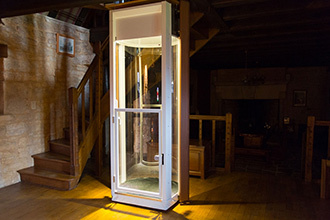 Why Buy Small Home Elevators From Nationwide Lifts? So why should you buy a small residential elevator online from Nationwide Lifts? We have a wide network of offices and affiliates across the country, so we are happy to offer our services anywhere! We also take customer service very seriously and encourage you to get in touch with one of our offices to answer any questions or concerns you may have. Our representatives are standing by to help you choose the perfect product for your needs. If you would like to purchase a small residential elevator, just fill out our form to request a free quote. We hope to hear from you soon! Need Help Finding the Right Elevator? You can use our helpful Residential Product Selector to find the elevator that fits your needs. Just answer a few simple questions and we'll give you recommendations to get you moving!